In the early hours of 12 December 1976, after a night on the town, Jack returned to his luxury penthouse in West Hollywood. By all accounts he poured himself a drink and settled back on his sofa with a cigarette before dropping into a drunken slumber. It was the act that doomed him. A couple of hours later, firefighters were called in to tackle a ferocious blaze at Cassidy HQ. Although they were able to quell the flames, help arrived too late to save Jack. His remains were found in the front hall near his front door, burned beyond recognition. An investigation found that he’d tried to crawl to safety only to suffocate through lack of oxygen. So a truly tragic end to the colourful life of Jack Cassidy, who was taken from us at the age of only 49. His death came less than 10 months after his final Columbo appearance in Now You See Him, which aired on 29 February 1976. Barbara Colby’s well-meaning but naive widow, Lilly La Sanka, suffered a terrible demise in Murder by the Book at Jack Cassidy’s hands. Barbara’s real-life fate is far sadder. On the night of 24 July 1975, Barbara had finished teaching an acting class in Venice, LA, and was returning to her car in a parking lot with fellow actor James Kiernan. There the pair were approached by two men in a van, and both were shot. When police arrived at the scene they found Kiernan clinging to life, but it was too late for Barbara. A bullet had entered her left lung through her arm and chest and she was dead at the scene. Before he, too, died in hospital a short time later, Kiernan was able to provide police with brief details of their attackers, who were said to be two black men in a light-coloured van. Neither Barbara nor her companion were robbed, highlighting the senselessness of the attack. Sadder still, although several arrests were made none were ever connected to Colby’s killing. Her case remains unsolved to this day and she was just 36 years old at the time of her murder. Read more details of this tragic case here. Beautiful Sal Mineo’s career was long past its peak by the time he starred as murder victim Rachman Habib in A Case of Immunity in 1975, but his murder the following year still sent shock waves across America. Little wonder, perhaps, given that Mineo was a two-time Oscar nominee who had been one of the world’s biggest rising stars after his breakthrough role as a 17-year-old in 1955’s Rebel Without a Cause. On 12 February 1976 – four months to the day that Case of Immunity first aired – Mineo returned home following a play rehearsal. After parking up below his West Hollywood apartment, he was attacked in his garage and stabbed in the heart. Witnesses report that he cried out for help before dying through loss of blood. He was 37 years of age. Police chased a wide variety of leads and the crime was assumed to have a ‘homosexual motivation’ before it was ultimately cracked. Pizza deliveryman Lionel Ray Williams was convicted of the crime in March 1979, revealing it was a botched robbery attempt, and sentenced to 57 years in jail. He was paroled in the early 1990s. Read more about Mineo’s death in the New York Times archive here. The above trio aren’t the only Columbo guest stars to meet an untimely end. Patricia Mattick (Margaret in Ransom for a Dead Man); Laurence Harvey (Emmett Clayton in The Most Dangerous Match); and Heidi Bruhl (Linda Robinson, also from The Most Dangerous Match) were all taken by cancer far too soon, at the ages of 52, 45 and 49 respectively. There are probably many other examples not immediately coming to mind, too. However, the the needlessness of the deaths of Cassidy, Colby and Mineo set them apart. We can only thank them for the contribution they made to Columbo, and hope they found peace wherever they ended up. Tags: Barbara Colby, Case of Immunity, Great Santini, Jack Cassidy, Ken Franklin, Lilly La Sanka, Murder By The Book, Now You See Him, Rachman Habib, Riley Greenleaf, Sal Mineo. Bookmark the permalink. I’m a big fan of Colombo, especially the 1970s episodes. It’s really tragic about the deaths of the actors mentioned. I have great respect also for the roles played by Patrick McGoogan. Colombo was one of the best tv shows ever made. I still watch them every Sunday on Sky tv. HI, there…quick FYI, it’s Barry Robins, not Barry Robbins. Who is the actual person that is The Columbophile writer? I and my husband think it is Peter Falk’s surviving wife Shera Danese . She would have such knowledge of Peter and his show,wasn’t she an actress that stared in many of the episodes like say six? Sorry to disappoint you Sandra, but I am NOT Shera Danese, nor can I stake any claim on knowing or even having met Mr Falk. I’m just a fan who enjoys sharing my love of the show with fellow fans. And you are doing it really well! I also knew about these deaths–strange how reality can be as mystifying as fiction. Living forever in our memory. A footnote about Sal Mineo: Just 18 days before his death, Mineo appeared in an episode of “Ellery Queen” (“The Adventure of the Wary Witness,” aired Jan. 25, 1976), another Link & Levinson creation. If you are including Columbo stars who died at a tragically young age of natural causes, then Laurence Harvey should be added as well. He died at 45 of stomach cancer (on November 25, 1973) only eight months after “The Most Dangerous Match” aired (on March 4, 1973). Laurence is mentioned here, towards the end along with some other stars who succumbed to cancer. The focus was on the main three tragedies. I’m sure there are many more examples of those lost to natural causes that I didn’t include here. Oops. So he is. My bad. I’d like to mention Barry Robbins (the King from A Case of Immunity), who died from an AIDS-related illness in 1986, being only 41. I really liked his role in Columbo and was sad when I learned his end after watching the episode (I like to browse the net afterwards and learn something about the actors). Are there any more episodes like Murder by the Book and A Case of Immunity, with two actors meeting a tragic real-life fate? 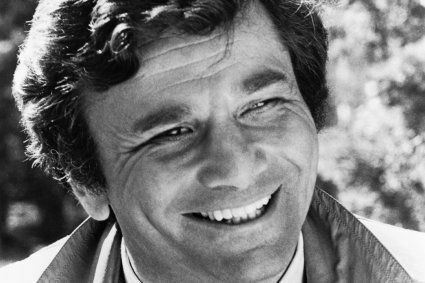 Oh, and how about Peter Falk himself? Paul says “It seems particularly ironic that a Columbo star would suffer an unsolved murder”. That’s very true. I view Falk’s Alzheimer-related death in a similar way: an extremely intelligent Columbo character ended up not even remembering his role… As always, thanks for the post. A reader of Facebook also referenced Barry Robbins’ death, which I wasn’t aware of at all. I will add him into the article. I agree with you -Jack Cassidy was my absolute favorite villain , and my next favorite one was Robert Vaughn -they both were excellent in their roles -they played them so effortlessly. I am watching Jack right now in the episode titled Publish or Perish . Thank you for the sad but excellent information. They helped make the show great. I was aware of Cassidy’s death and its tragic circumstances, but not Mineo or Colby. How sad that they, and the others you mentioned, didn’t live to a ripe old age. It seems particularly ironic that a Columbo star would suffer an unsolved murder; if only there were a Columbo to discover who killed Colby. May they all Rest In Peace.